The Hebrew daily Maariv is reporting that Israel is preparing to attack Iran's nuclear weapons sites in cooperation with the United States. The paper reports that the Israel Air Force has been training on long-range flights, including refueling in mid-flight. The training has apparently been going on for some time, but it was only released for publication today. Israel's intelligence assessments indicate that once Iran passes the point of no return in its nuclear efforts, the entire Middle East will enter a frantic nuclear armament race, led by Egypt and Saudi Arabia. At the end of 2007, Israel and the US will assess the new sanctions against Iran to see whether they are working. The article implies that if the sanctions fail Iran's nuclear facilities will be attacked. The 'new' sanctions include 'exerting pressure on European governments' to cancel US $22 billion in loan guarantees that are given annually to European companies trading with Iran (it's astounding this wasn't done long ago), sanctions against banks working with Iran, non-renewal of oil infrastructure in Iran and a long series of economic actions that are meant to seriously hurt the Iranian economy. The Jerusalem Post adds that the Air Force has significantly upgraded its cooperation with the United States Air Force (Hat Tip: NY Nana). The IAF now receives regular updates on American procurement decisions. An agreement on the cooperation was reached at meetings last month between head of IAF Procurement and Equipment Brig.-Gen. Dr. Kobi Bortman and senior USAF officers in Washington and Dayton, Ohio. Bortman, an expert on aircraft structural engineering with a doctorate from Washington University in St. Louis, gave the Americans a demonstration of the IAF's Enterprise Resources Planning system. The system serves as a single database for both manpower and inventory lists and enables cost-effective maintenance of supplies and other resources. The USAF, which briefed Bortman on its own new cost-saving system for keeping track of inventory, decided following the meeting to establish its own Enterprise Resources Planning database. "We are interested in many of the same platforms and systems, and the Americans look at us as a small-scale laboratory of themselves," a high-ranking IAF officer told the Post. "Now every time the USAF signs a contract and purchases something new, they will update us." The updates will only be given to Israel, the officer said, when America purchases a system or platform related to the IAF. An American delegation will come to Israel to meet with Bortman again toward the end of the year. One issue of common interest for the IAF and USAF is the "J" model of Lockheed Martin's C-130 Hercules transport plane. Israel is considering purchasing the new model for its 40-year-old fleet of transport aircraft and in March submitted a Request for Information to Lockheed Martin to receive details on the J model's cost and performance. India, Norway and Canada recently signed contracts to purchase the new aircraft. The newest version of the Hercules, the J model is externally similar to the classic Hercules, but inside it is a different aircraft and includes new Rolls-Royce Allison AE21000 turboprops with six-bladed composite propellers and digital avionics, including heads-up displays for the pilots. According to a top IAF officer, Israel would like to buy the new aircraft but is waiting to receive a price offer from Lockheed before it begins negotiations. The decision to buy the aircraft is also pending a decision in the General Staff. The IAF is also considering sending its younger Hercules planes to Boeing Co. for an upgrade under the company's C-130 Avionics Modernization Program. In September, Boeing announced the first flight of a C-130 aircraft that had had its cockpit gutted and revamped to improve navigation and communication. 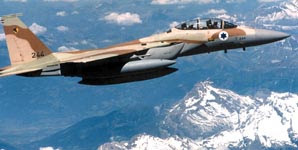 Israel would be foolish not to prepare for a strike against Iran, but I still don't think it will happen anytime soon. Unless it looks like Iran will be online sooner, I would not look for an Israeli strike against Iran - with or without American participation - before the summer of 2008. But I do believe that if a strike is necessary to vitiate Iran's nuclear capability that it will come while President Bush is still in office. But this is not the first time we've heard that Israel is preparing for a strike against Iran, so other than the cooperation upgrade, which seems significant, this is really nothing new. Thanks for the hat tip, Carl. There have, as you said, been so many articles re Israel preparing for a first strike on Iran. I am somewhat uneasy with this repeated assumption, as it seems to put a tremendous burden on Israel alone. I would hope it would be shared with the USA at the very least. When dealing with a madman like Ahmadinadinnerjacket? 'Reading' him seems akin to trying to keep mercury contained in a thimble with no cover. Fatah's torture chambers - do they matter? Civil war coming in the 'West Bank'?